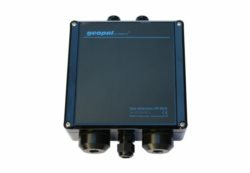 Geopal MODBUS detector for underground parking areas can be quoted for both NOx and CO (carbon monoxide) in one unit. Detection of both NOx and CO is breathing height. Only a simple installation is required. GP-BUS detector is full addressable. The gas level is detected by each detector which response to the Master PLC together with the status of the MODBUS unit. GP-BUS detector can be connected to a GP-CU detector to detect CH (hydro carbone) from petrol cars. The GP-CU detector is placed approx. 15 cm above floor level. You will find an example of Geopal System MODBUS for underground parking here.